What's with Bofur's hat? For that matter, why do we keep getting short-bearded dwarves? Bombur is a better Volstagg than we got in the Thor movie, and it's nice to see James Nesbitt's wry smile as Bofur; he looks the part of a greedy treasure hunter. I must say that Bofur's war-mattock looks great! Bifur's beard looks alright. As to why so many short bearded dwarves, if they weren't short they wouldn't be dwarves? if they weren't short they wouldn't be dwarves? Beards are a status symbol; not all of the dwarves following Thorin were high-status. He seems to be holding a ladle, perhaps suggesting that they're making him the fat cook of the party, as they did with Sam in the original trilogy. Otherwise it could be a rock-throwing device. Oh man Nesbitt Bofur is like, my favorite thing, goofy hat & all! The more of these I see the less excited I am. 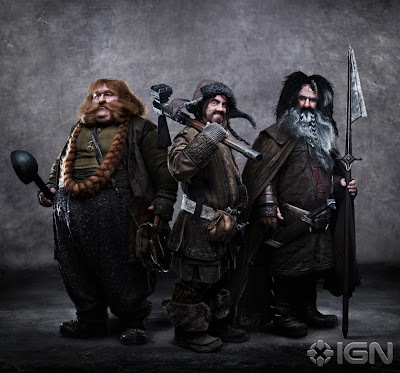 Apart from the issue of beards...there seems to be a comic element to these dwarves and, therefore, probably this movie that, although it may be in keeping with the book, is not something that personally appeals to me. I guess I was hoping that they would make The Hobbit a 'serious' prequel to Lord of the Rings. Maybe it's because I actually read the hobbit after I read Lord of the Rings and it, therefore, always seemed...less epic. The deal with Bofur's hat is that he's the wild, slightly unhinged one. Manic, perhaps slightly bloodthirsty comic-relief, ho! why do we keep getting short-bearded dwarves? Clever giving the fat guy a ladle. Will he wield a joint of beef in the other hand? And to his short beard, who'd want to have to keep a long one clean after the amount of eating he's been doing (Bofur's got no excuse) ? Actually, these bug me the least, hat, ladle and all. Why, perhaps because they've got a somewhat bumbling look and that's something I've always thought of them as being, save for Thorin and Balin. And again, that comes back to them being miners not adventurers. I actually like these three more than the others. They are less martial and more like the dwarves I imagined. I also like that their look has Russian and Orthodox Jewish elements. Tolkien stated that his image of Dwarf society was partially inspired by the depictions of medieval Jews. Bombur's always been comic relief, unlike Sam, so it's not surprising that - holyhellwhathehellisthat embedded in Bifur's skull?! I guess there was a mining accident? John, you're right. There's something unpleasant embedded in Bifur's forehead. Actually, Bombur does have a long beard, so long in fact that's it's braided and wrapped around his neck. Looks Good! I like these dwarves better than Jackson's Gimli aberration. Alright some of these guys look a little closer to dwarves - the costumes sort of reflect that they actually work in a mine, and are not long haired rock and roll prima donna casualties of fashion. My objection to the other images was that it looks like PJ was aiming to squeeze The Hobbit out of the same tube he used for LotR. But now, if he does do something comic, his use of the same black metallic pallete that has become a staple of darkly heroic movies, will heighten the mock-epic qualities of The Hobbit. Even though it's clear that the dwarves in the novel are not "real" heroes or adventurers, it's also clear that they think of themselves as such. I'd say the same about these guys. I guess I was hoping that they would make The Hobbit a 'serious' prequel to Lord of the Rings. If anything needs to be taken seriously, it's a story about thirteen dwarves, a rabbit-like gnome and a disappearing wizard in search of a dragon's cave filled with gold. The whining about production stills from a movie that just started shooting is almost comical. At least disgruntled Star Wars fans waited until after The Phantom Menace was released before they started weeping that George Lucas "raped my childhood". I fully agree with Elfdart. Complaining about stills is almost comical. Once we see these guys in the movie, the look may be very different. You have to imagine the backdrops and such. It's ultimately the story and the scope that matters. George Lucas comes up with awesome-looking characters and terrible stories, for instance. Otherwise, they look fine to me. But I wouldn't remember one dwarf from another, having read The Hobbit only once years ago. Well, I just reread the Hobbit and Tolkien does little to differentiate most of the dwarves. I like them. In fact, the only one I haven't liked is the black haired Kili (and I REALLY don't like his look). Otherwise they are well done. Oh, and I love the mattock! This film is going to be garbage, just like the other three. "At least disgruntled Star Wars fans waited until after The Phantom Menace was released before they started weeping that George Lucas "raped my childhood"." Nah, I started whining before that, right about when George ejaculated on my innocense with the remakes. I would say that the most likely reason that many of these dwarves have short beards is that they have yet to earn the right to wear a long beard. James is right, Filli and Killi were minors when they went on the expedition. They're also the party's main scouts, and their youth might explain their physique. Perhaps you should read the wiki attached to the hobbit movie; it contains a lot of information about the book, and compares the depiction of the characters to the previous movie. You might learn something about both the book and Jackson's interpretation of it. I have not, but then neither have I ever been one of Khazâd. I would say that the most likely reason that many of these dwarves have short beards is that they are all different people who have chosen to grow their beards different lengths. Frankly these are good enough that I'm feeling much better after my small doubts from Fili and Kili. The whining about production stills from a movie that just started shooting is almost comical. What's more comical to me is the whining about the whining. What's more comical to me is the whining about the whining about the whining. - Your turn. James, I'm not sure what your issue is with the hat? It's a pretty common form of eastern European clothing, and if Tolkien modeled the Dwarves on Jews then this sort of hat would be pretty common amongst anyone from further East than Poland. Is there something wrong with giving these characters outfits based on real-life outfits from anywhere except Northern Europe? And if so, how do you square that with the Jewish angle that Tolkien is supposed to have followed with the Dwarves? The history of European Jewry was written in the East, so an Eastern European influence on their clothing would surely be acceptable, no? I think most of the people complaining about this movie are guilty of a) jumping the gun, b) misunderstanding the influences on and history of the hobbit, and c) privileging their own view of the Hobbit over a director's attempt to construct a shared vision. As far as I can tell Jackson's attempts to create that shared vision are far more defensible based on the background material than you're giving him credit for. The hat looks like Mongolian to me, not Eastern European, though I readily grant that many Eastern European items have their origins in Asia. Since we see no other dwarves dressed this way, it sticks out much more than if they'd all worn attire that was "eastern" in appearance. It's an Ushanka, James, and the wikipedia entry on it has a picture of a German hunter wearing one in 1643. If you look up pictures of ghettoes, stalingrad, Napoleon's retreat etc. you'll see them all over the shop. I really think you need to revisit both the source material, the wiki that the Hobbit crew are putting together, and the various middle earth websites, because you're distorting the source material horribly in order to defend your lowered expectations. None of what you see is what you think it is. That doesn't look like an ushanka to me, but more like the kind of hats I associate with illustrations of medieval Mongol warriors, but I'll happily concede the point, if I'm mistaken. Where is this wiki? You have piqued my curiosity. I'm not sure if it's actually connected to the movie, but it looks like it from the content. Here is the entry on Fili and Kili, that makes clear they're minors (and should be expected therefore to have short beards). You can see from this that the Dwarves actually have a lot of backstory (contra your earlier suggestion that giving them backstory is "ludicrous"). I think this wiki helps to show that some of Jackson's design decisions aren't as way out or treacherous as you suggest. The main page is here, and certainly looks like it's connected to Jackson's movies, though I could be mistaken. Perhaps you've seen these already? Also I strongly recommend you watch Meet the Feebles and Bad Taste if you haven't already. Jackson is not an American movie maker and it really helps to understand his interpretation of Tolkien if you get at least some insight into the antipodean cultural framework within which he is operating. I like Bofur's look. He looks like the dwarven equivalent of a type of fella you see working in auto repair or body shops. Little wiry guys who you never see the top of their head 'cos they're always wearing an oil stained giveaway ball cap. No, thank you very much. For my sanity's sake, I vowed to never more watch a PJ movie. And if you wanna make a nationalist issue of this, you are missing the target. What the USA have to do with it? It's not a matter of American vs. Australian, but of English vs. whoever PJ is representing. Tolkien's hobbits are a good old-fashioned parody of good old-fashioned English people (which -I mean, the parody- already was old-fashioned when LOTR was published). PJ's hobbits are... what are they meant to be? I didn't get it. Maybe generic D&D halflings? It doesn't help that the original soundtrack theme for the Shire sounds unmistakenly *Irish* to my ears. I'd strongly recommend Meet the Feebles and Bad Taste to almost anyone, they're both classic OTT schlock, BT was made on weekends over a few years with friends but still has an amazing fight scene on a cliff and MtF is a surefire cure Muppet sweetness.